Y’see this happy chap? It’s from startwoodworking.com btw, it’s surprisingly hard to find a good side-on photo of how you use a hand plane. You’ll notice that he’s pushing the hand plane along the wood using his leg muscles more than his arm muscles, by leaning into the plane as he pushes it. This is normal, natural movement that you do any time you push an object that isn’t sliding round like a greased pig in a swimming pool. Do you see what else he’s go there? This is the shed at the moment. Lean into the plane? I’m doing well if I can reach the shagging thing at the moment. *sigh*. 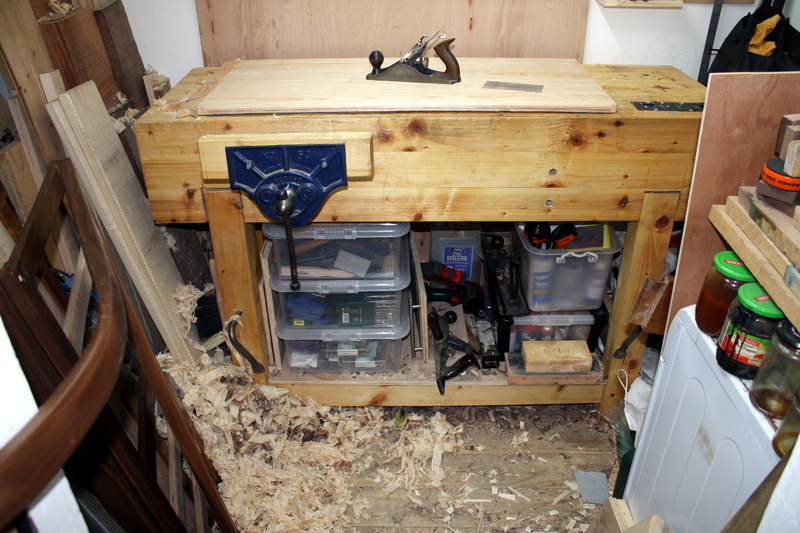 And I have to thickness drawer sides, which means taking off wood, half a millimetre at a time in a 2cm-wide strip. Over a whole board. Evenly. By about eight millimetres. Gah. See this thing? 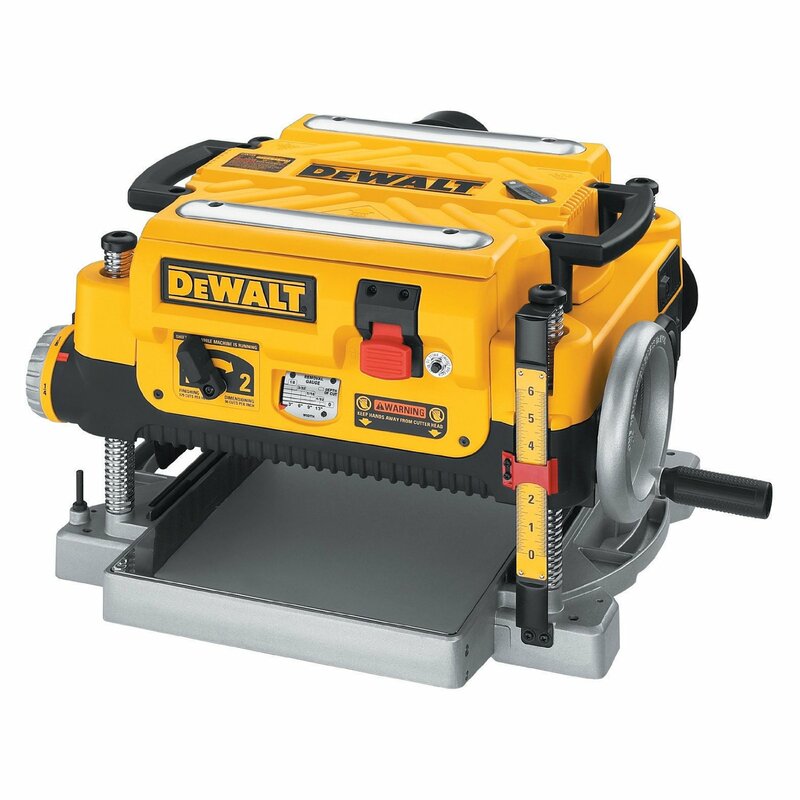 This is a dewalt 735 planer thicknesser. It costs nearly €700 if you’re silly enough to buy it in a shop in Dublin where the prices are usually 50% too high. And if I had the room to store it, I would have bought two of them by now. I mean, finish planing, that’s one thing. It’s awkward, but even on the largest panel in the crib it was doable. Granted, you need the card scraper in places and it’s a pain having nowhere to stand at times. But thicknessing, that’s a whole other story. There’s no finesse in that, it’s just lots of pushing through wood and hoping it ends soon. 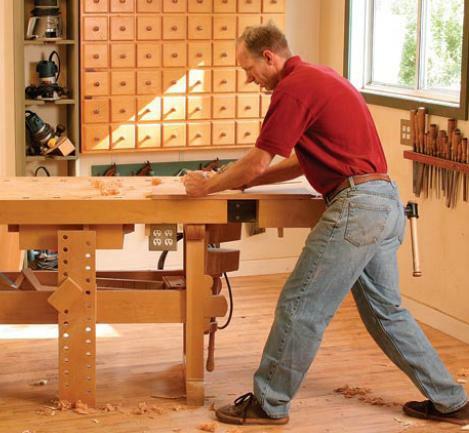 Christopher Schwartz was right, the first power tool you should get is a planer thicknesser. It’s just that they’re also bloody loud. This is not a machine that endears you to the neighbours if you use it at 2200h on a worknight. It’s about as loud as your wife finding you feeding the neighbourhood cat. To the blender. 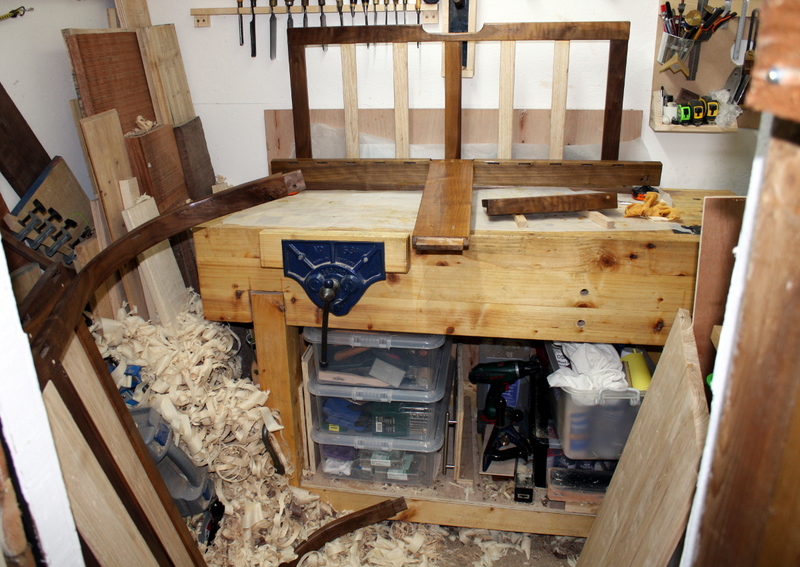 I mean, ideally, I’d resaw the boards to thickness, but honestly, I’ve had enough of that. The ryoba is just not up to the job if the plank is more than two or three inches wide, and I’m still waiting for saw files to sharpen the western saws I have but so far they’ve just not made the task any easier. 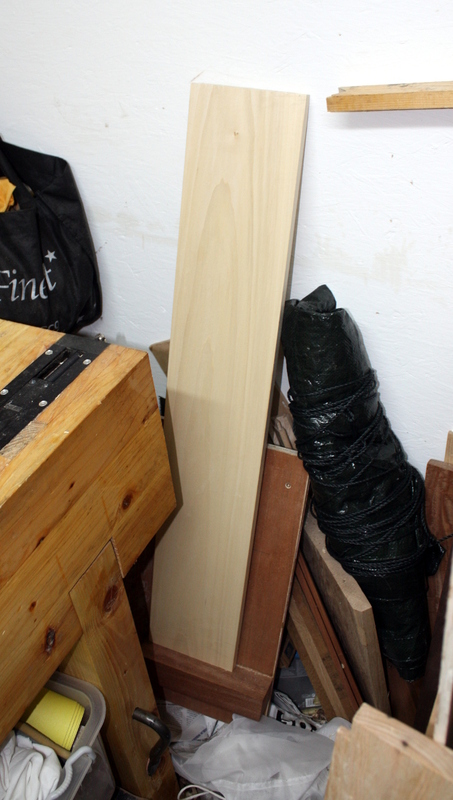 A bandsaw might, but (a) where the hell would I put it, and (b) bandsaws that can resaw an eight-inch-wide board are not like bandsaws that are just used for cutting curves; they are not small things. You have to use wider blades for reasons that involve clearing a kerf, physics and metallurgy, and those wider blades need larger wheels in the bandsaw to cope with bending radii, and that leads to a big freestanding monster of a machine. So basically, I’m stuck inside the limits of the 8’x6′ shed. At least for now. But every so often, it’s helpful to complane (see what I did there?) about it. At least the top panel is finish planed and one of the drawer sides is now thicknessed. 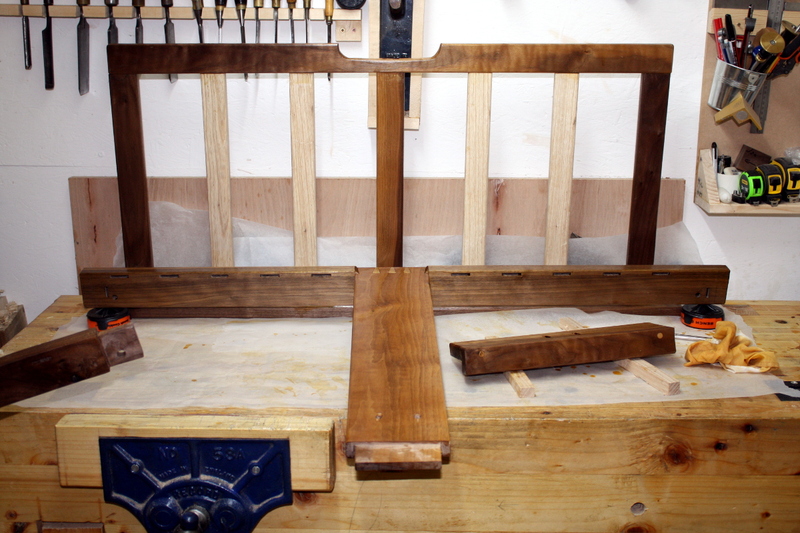 And the final coat of shellac is on the mattress platform and on the rear upright. So not a totally wasted hour or two in the shed.